Please Note: This Website Is Set Up For U.S. Orders Only. We are not able to ship to Canada or any other country at this time. Thank You! 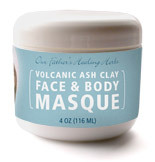 I have really benefited from using the Bentonite clay on my wound. It's the fastest way to remove the poisons and inflammation, and I am healing very nicely now. I have also used a clay poultice to heal up my bug bites fast. May be used on any part of the body that is painful, swollen, hot or red. Excellent for rejuvenating, cleansing, and detoxifying skin cells.